I learned years ago (when I did not have in-home help) that if I don’t involve Billy Ray in housework it isn’t going to get done. Consequently he loves to do it and prefers to it to many activities that other kids might do. He especially likes mopping as you can see by the picture. He used to spill water intentionally so he could mop. As I wrote in Keep Him Busy or Else we have learned that if we do not have constructive things for Billy Ray to do he will fill the time though not necessarily with acceptable things. Support staff seem to react to his love of housework in various ways. Some think it is their job to do it if it is scheduled and go crazy cleaning our house while trying to get him to watch a movie or follow them around while they do the task. One former staff refused to do it because he said that we were only having Billy Ray do yard work or housework so that staff did it. Both miss our point. It’s Billy Ray’s home too and he should contribute to its’ maintenance to the degree he can. I have gone round and round with former staff about not doing it for him. Additionally, it is not “Billy Ray help me make your bed”. It is his bed he should make it and he can. The cue should be “It’s time to make your bed. I’ll help you if you need it.” The bedspread may not be straight and smooth every time but he needs the satisfaction of making his own bed. It is my dream that Billy Ray will have his own home someday. I know that he will always have to have staff but I want him to be able to do as much as possible to make it feel like his own home. I want him to have support from staff only the degree he needs it. Thus, tasks should be appropriate to what he is able to do with assistance. I have made a list of what he can do with assistance and what he would need to do if he had his own home. Is it something that he needs to do as an adult in his own home? Is it something that he is able to understand and participate? Does it benefit his personal needs? For example, we wouldn’t have him clean the master bathroom but the main bathroom is the bathroom he uses so it would be appropriate for him to assist in cleaning that bathroom. He contributes to the messes made in the kitchen, living room, etc. and the garbage accumulated so assisting with that would be appropriate. 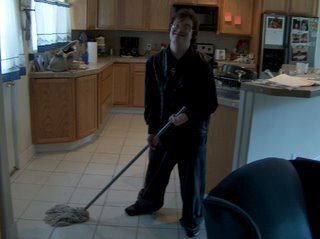 His bedroom is just that his bedroom so he should maintain to the degree he is able to do with assistance. We could go on and on with examples. I think you get the idea. When I don’t have help with him such as on the weekends, I do have him participate with me in activities that are not as specific to him because I can’t supervise him on a one to one basis and get needed things done at the same time otherwise. For example, I help him with his laundry and he helps me with general family laundry.